25th Nov 2012 was a significantly important day. It was the day of “Kaisika Dwadasi”- the day in which . ‘Kaisika puranam’ is read before the Lord. Read my earlier post on ‘Kaisika Puranam ~ the story of Nampaduvan and the benefits of hearing to the Puranam. It was the day of ‘Vanabojana Uthsavam’ too. 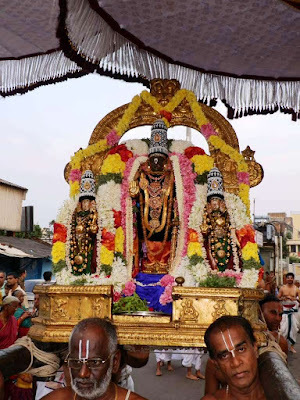 Understand that till about a decade ago, for this Uthsavam, Lord Parthasarathi used to visit Vasantha Uthsava Bungalow at Venkatarangam Street, Thiruvallikkeni, which was a pristine place with trees, ponds, flowers, fragrant smell and more. Thirumanjanam used to be performed over there. 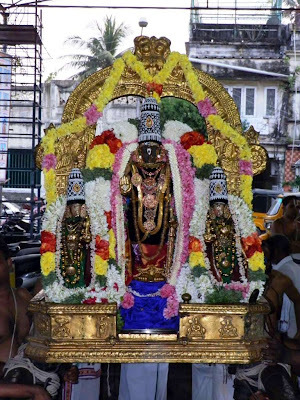 In the evening of 25th Nov 2012, there was periya mada veethi purappadu of Lord Parthasarathi. 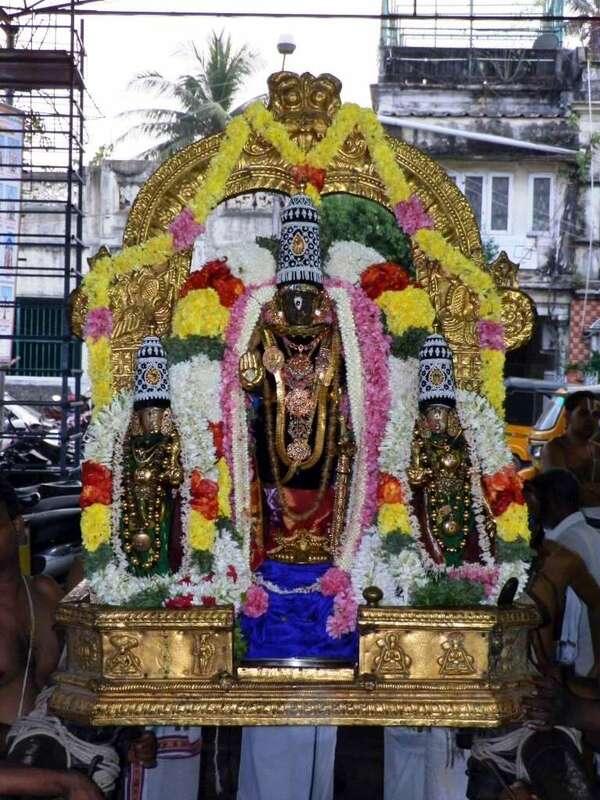 Today, evening there will be veedhi purappadu of Sri Parthasarathi at Triplicane. 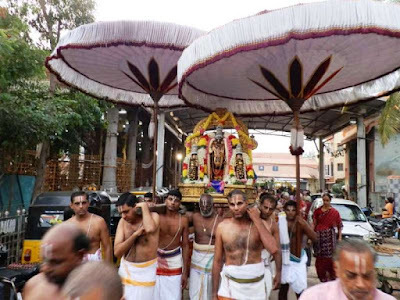 The purappadu was unique in another sense as it was ‘Sthothra padal goshti’ when Dhati Panchakam, Sthothra Ratnam, Purva dinasarya, Uthara dinasarya were rendered by the goshti. Dhati Panchakam speaks of the victory of Sri RamanujaCharya over other philosophies and his establishing Vishishtadvaita philosophy ~ it is made of 5 slokas. 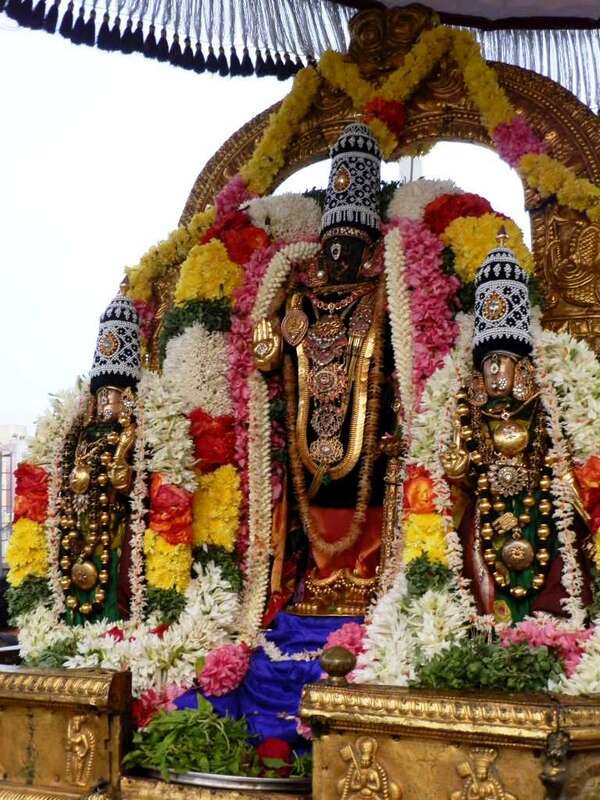 It is attributed to the disciple of Emperumanaar Sri Swami Koorathazhwan.